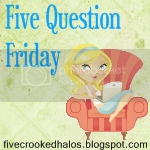 It looks like my usual Five Question Friday blog hop is taking the week off. But I’m not…. I decided to make up my own questions! So, here we go…. be sure and share your answers in the comments below! Left-handed or right-handed? I write left handed, but use scissors with my right hand… and I throw with my hand. Weird, huh? Also weird is that my sister and I are left-handed and both our parents are right handed. Favorite city to visit in the United States? I love music, especially country music. With that said, I love, love, LOVE Nashville, Tennessee. I am visiting Seattle next week and it’s been on my bucket list for awhile now, so my answer my change after this trip. Stay tuned! Favorite ride at Disney World or Disneyland? I love the Haunted Mansion. Some may think it’s cheesy, but I love it. I’d ride it over and over back to back if they’d let me. You were just given a yacht.. what would you name it? When we were in Tampa last month, we saw a really pretty boat named “His Dog House”. Ha! That name cracked me up, such a great name for a boat.. or a yacht! What is the first thing you think of when you wake up each morning? Both my girls usually wake up before me, actually I usually wake up because I hear them creeping around the house. So, the first thing I usually think about is “what are they getting into?” And it’s usually Molly being sneaky and trying to unload the dishwasher or something. She’s figured out all the baby gates around here – there’s no stopping her!